Made of synthetic materials, it has a matching nylon binding, a rounded toe and gross-grain bow tie. Plastic heel and a rubber sole. Capezio« taps. A great tap shoe for beginners. Children's sizes. 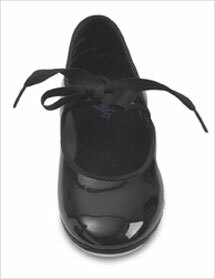 Patent leather look comes in child's size 5.5, 6 and 6.5, medium width only.